The cartridges which will fit in this dispenser are 66738, 62801, 54611, 10432, 59523, 44548, 31577 and 70530. Does your own brand foaming soap fit this dispenser? Our own brand foaming soap cartridges (52784), will only fit our own brand dispenser (60010). Do you sell Mr Soapy dispenser keys separately? We do indeed sell the keys separately. Product code 45327. 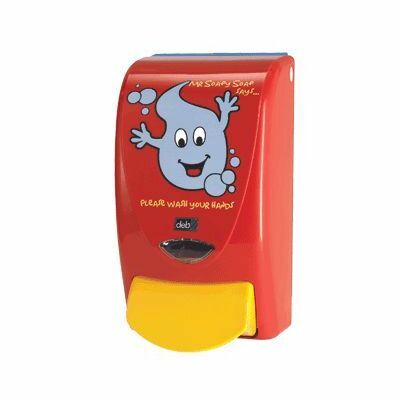 Designed exclusively for use in nurseries or primary schools, the Mr Soapy Soap Dispenser has been shown to improve compliance with hand washing routines. The bright and colourful design attracts attention and encourages repeated use with a durable ABS plastic casing that stands up to the rigours of younger hands. Suitable for wiping clean and disinfecting, the non-gender specific tones have been chosen to make it suitable for everyone with a curved design that minimises bacteria growth sites. An easy to use construction allows the entire body to be compressed in for easy removal and can be auctioned with either the hand or elbow. For high traffic washrooms, the soap dispenser has a non-drip and non-clog dispensing mechanism requiring minimum maintenance. This soap dispenser is compatible with a range of products available here on our website including the Cutan Foam Hand Sanitiser, Cutan Gel Hand Sanitiser and the Cutan Foam Soap Cartridge.